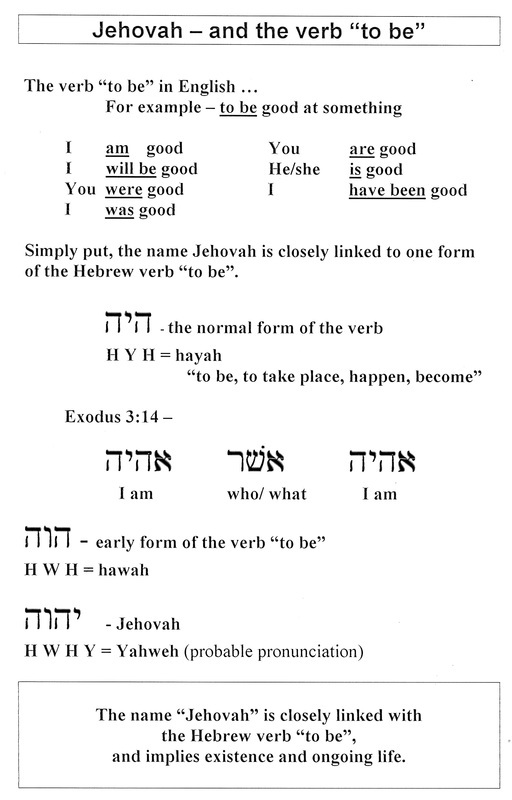 The name "Jehovah" or "Yahweh" is related to the Hebrew verb "to be", and has a sense of perpetual existence. Note the way that this idea of past, present and future is conveyed in the verses below. Remember that the word "LORD" may be substituted with the name "Jehovah" or "Yahweh". Notice also that these same ideas are then attributed to the Lord Jesus Christ in the New Testament references. Psalm 102:25-27 - Of old hast thou laid the foundation of the earth: and the heavens are the work of thy hands. They shall perish, but thou shalt endure: yea, all of them shall wax old like a garment; as a vesture shalt thou change them, and they shall be changed: But thou art the same, and thy years shall have no end. Jeremiah 10:10-12 - But the LORD is the true God, he is the living God, and an everlasting king: at his wrath the earth shall tremble, and the nations shall not be able to abide his indignation…. He hath made the earth by his power, he hath established the world by his wisdom, and hath stretched out the heavens by his discretion. Isaiah 43:10,11 - before me there was no God formed, neither shall there be after me. I, even I, am the LORD; and beside me there is no saviour. Micah 5:2 - Bethlehem … out of thee shall he come forth unto me [one] that is to be ruler in Israel; whose goings forth have been from of old, from everlasting. Isaiah 44:6 - Thus saith the LORD the King of Israel, and his redeemer the LORD of hosts; I am the first, and I am the last; and beside me there is no God. Revelation 1:8 (also v.17,18) - I am Alpha and Omega, the beginning and the ending, saith the Lord, which is, and which was, and which is to come, the Almighty. Hebrews 13:8 - Jesus Christ the same yesterday and today and forever. John 8:58 – Before Abraham was, I am.